I came to social marketing through an interest in health communication and using the mass media to promote healthy behaviors. Out of college, I had worked developing content at a health promotion software company (which was way ahead of its time in exploring ways to provide health information via videotex and proto-internet portals like Prodigy) and heading up a traffic safety program at a county health department, before going to grad school. 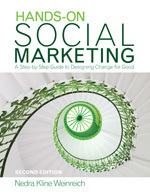 While getting my master’s degree in public health, I happened to hear mention of something called “social marketing,” though nobody really talked about it in any of my classes. I landed an internship with Porter Novelli in Washington DC, working on some of their social marketing projects like Five a Day and USAID-funded international programs. And I knew I’d found my calling. I focused on social marketing throughout my studies, working on building up related research and evaluation skills and marketing/communications knowledge. After graduating, I went back to DC, which was (and still is) the epicenter of social marketing. I worked for a while for a Federal contractor doing marketing for an HHS agency’s clearinghouse, but did not have much opportunity to address behavior change-related issues. I eventually decided to become a consultant and pursue the kind of social marketing work I wanted to do. In 1995, I started Weinreich Communications and was selected to coordinate a social marketing project to prevent unintended pregnancies among young women in six states, funded by the Public Health Service. And many clients and projects later, here I am. From what I have seen, just about everyone who has been working in social marketing for a while has taken a different route to arrive where they are (though newer social marketers have slightly more straightforward paths available now). Traditionally, there have been two main tracks that feed into the field of social marketing — either from the public health side or via the commercial marketing sector. Becoming more common nowadays also are people with a nonprofit marketing or activist background, particularly coming from the environmental advocacy arena. More and more often, you will see jobs with titles like “social marketing coordinator” or “director of social marketing,” which was not very common even five years ago. You might also need to look for a position which is not necessarily focused on social marketing, but in which you can bring its principles and practices in your interventions. So, health educators, project directors, communication managers, and account executives may use social marketing as one tool in their professional belt, or might be able to shape their jobs to focus more on that aspect of the work. Of course, a healthy dose of curiosity, creativity and common sense are necessary. And the ability to see the world through someone else’s eyes and realize that we don’t necessarily hold all the answers ourselves help too. If others (social marketers and otherwise) have additional career advice for people interested in this field, please add it in the comments. Good luck in helping us change the world – we need you! Thank you for sharing your expertise regarding this career. I’ve been doing information dissemination at the clearinghouse of one of HHS’s agencies for several years. I’ve begun researching opportunities for advancing to social marketing, and your web site is one of the most helpful resources I’ve found. Thank you for sharing your experience. I hear things like “we need more people in social marketing field” every day, but it is frustrating to find out nobody wants to hire graduates fresh out of MA program without previous social marketing experience. I have contacted numerous sources asking for job opportunities, but they all only want to hire people who have worked in the field before. How does one start fresh out of school? You’re right that this Catch-22 exists, as it does for getting just about any type of professional job. Though this may not help you now, ideally graduate students who realize that they want to go into social marketing will make sure they take the right classes to build their skills and look for internships or school-based opportunities to get at least some kind of relevant experience. You may need to look at jobs that are not necessarily labeled “social marketing” positions, but in which you can use social marketing tools and skills. These might include health education or community outreach jobs. Or, depending on the field in which you earned your degree, you might need to take a job in which you’re doing some type of marketing or PR, but which is not necessarily related to health or social issues, in order to get the experience. There are likely many local nonprofits that would be thrilled to have your help as a volunteer outside of your day job, that might give you an opportunity to get some social marketing experience under your belt. If your degree was not specifically in social marketing, you might consider enrolling in a certificate program such as the ones at University of South Florida or George Washington University to build additional credentials. Social marketing is still a relatively small field, very dependent on the vagaries of funding, so the numbers of open positions shift with time. Don’t give up, and find/make some opportunities to get that experience so that you can eventually jump in as a full-fledged social marketer.